Canon announced their new camera on Februrary 5, 2015. Delivery is scheduled to commence the end of June. If you are thinking of moving up to the Canon EOS-5Ds and EOS-5DsR cameras from the EOS-5D Mk III, the article below from Canon Digital Learning Center highlights the added features in the new cameras. If you have decided to buy the new camera, read this article on how to get the most out of the 50MP files. I am not going to get this camera. It is too slow for wildlife photography. Waiting for the EOS-5D Mk IV and EOS-1D X Mk II to come later this year. You can see how this camera compares to the EOS-5D Mk III and Nikon D810. Current EOS 5D Mark III shooters, who may be considering moving to the new high-resolution EOS 5DS (or the EOS 5DS R, which removes the effect of low-pass filtration), may wonder if anything changed on these new cameras because the new models look practically identical to the proven Mark III camera. Rest assured, there are some new rewards waiting to greet 5D Mark III owners who step up to the new cameras. We can’t touch on every single one, but we’ll try to give an overview of many of the new details. Obviously, the biggest is the move to a 50.6 million pixel CMOS image sensor – more than doubling the pixel count from the Mark III model. You’ve no doubt seen discussion of this, so we’ll go a bit more beneath the surface. Everything we discuss here applies to both the EOS 5DS and 5DS R models. The same body design, control layout, and dimensions may lead you to think it’s just an EOS 5D Mark III with a high-resolution sensor. Even though the body looks the same, it has a few differences. Most notable is something you can’t see — a stronger baseplate and tripod socket, to minimize the impact of vibration. If you shoot with shorter lenses on a tripod, this is a good thing. Touch the shutter button and icons displaying current settings for battery condition, white balance, drive speed, and more appear along the bottom of the finder. These can easily be toggled on and off in the EOS 5DS Set-up Menu. The same analog Exposure Compensation scale appears below the EOS 5DS viewfinder as in the EOS 5D Mark III. But any time it’s active, the “+/-” Exposure Compensation icon also appears, both in the finder and on the top LCD panel. It’s a thoughtful addition to remind users that compensation is set somewhere other than the “zero” setting; the scale continues to indicate the exact level of compensation applied. This is for ambient exposure compensation only. The shooting information icons can be really useful for changing settings with the camera up at your eye — with a little practice, it’s easy to press one of the top buttons and then turn either the top or back dial to quickly change White Balance, drive speed, switch to Spot metering, or whatever. It’s something every EOS 5DS user should try. And anyone who leverages the camera’s great AF system and 5fps shooting speed for moving subjects will appreciate the illumination of AF points in AI Servo AF mode, if they’re working in dim light. You won’t see this in the viewfinder, but it’s one of the most significant improvements in the EOS 5DS versus the Mark III models. It’s a supremely accurate new metering system, now with the ability to make subtle adjustments for subject (and lighting) color. The metering sensor can even detect human faces and emphasize them during Evaluative metering, instead of clothes or surrounding areas. And this same color metering sensor is used for E-TTL flash metering with Canon EX-series Speedlites. This is another benefit of the 150,000 pixel RGB meter. It’s fast enough to detect the rapid on-off cycling of certain types of artificial lights (think of fluorescents, etc.) and, when necessary, alter shutter timing to capture each shot when the ambient light is at its peak brightness. If you use the EOS 5DS for location shooting, this is a feature you’ll come to appreciate. As the first EOS 5D to have this ability, the EOS 5DS can use its 150,000 pixel RGB metering system to assist the AF system in locating and rapidly changing AF points to keep up with subjects moving across the frame. This works with continuous AI Servo AF when all AF points are active (Automatic AF point select mode), as well as during Zone AF. Big potential gains in metering capabilities with the switch to RGB color metering in the EOS 5DS. Maybe the biggest improvement will be in flash exposure consistency when shooting with E-TTL flash. Any nature, wildlife or sports shooters who has been frustrated with Automatic AF point selection in AI Servo AF will likely see improvements with EOS iTR — color metering that teams up with the AF system to give it more information about subject size and location. Canon AWB has always been tuned to deliberately emphasize warm ambient tones when shooting in artificial light, such as tungsten and similar sources. The EOS 5DS is the first EOS model to give photographers who use Auto White Balance a choice: “Ambience Priority,” which is the traditional EOS flavor, and “White Priority.” The latter aims for a truly neutral color rendition in tungsten light situations. It’s set in the 2nd Shooting Menu. Similar to Adobe Photoshop’s™ “Unsharp Mask” function, the EOS 5DS now provides independent control for each Picture Style setting for “Fineness” (similar to the “Radius” setting in Photoshop, it adjusts the pixel amount that sharpening will impact) and “Threshold” (changes the brightness difference before pixel areas will be sharpened… higher values will lessen the sharpening impact on any digital noise in an image). These are for still-image shooting only and not for EOS 5DS video. Taking full advantage of the detail that 50.6 million effective pixels provide, EOS 5DS adds a new Picture Style choice called “Fine Detail.” It emphasizes precise sharpening with pre-defined low settings for Fineness and Threshold (both user-adjustable, if you desire), along with fairly strong sharpening (pre-set to level 3 of 7). What’s really nice is that while it’s a sharper file, contrast and color saturation are backed off from what the Standard Picture Style provides, so in many ways, it’s a more user-friendly file. Even if you always shoot RAW images, initially setting a good white balance means a better starting point when it’s time to process them in the computer. And the new Picture Style options mean a few things: sharper rendering even during playback on the LCD monitor (or an external monitor), and certainly the potential of greater inherent sharpness if and when you do shoot JPEG images in-camera. It may look the same, but the entire mirror box and movement system in the EOS 5DS is completely new. Mirror movement is now motor-controlled, rather than largely powered by springs, and the mirror’s movement is cushioned at the up and down positions by a clever cam drive system. 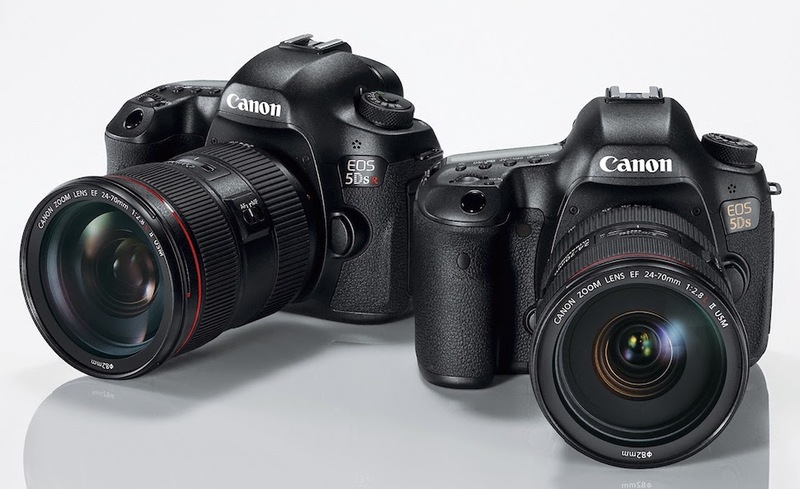 The biggest difference the EOS 5D Mark III user may notice? The sound when the shutter is fired. Any vibration from mirror or shutter movement is a potential problem with ultra high resolution cameras. The new, motorized mirror movement (above) minimizes this to a great degree. But mirror lock has new possibilities, too. Set in the Shooting Menu, you have options for traditional Canon mirror lock (press shutter button once to lock-up mirror for up to 30 seconds; press again to fire shutter within that 30 seconds.) But EOS 5DS adds options to delay shutter firing, anywhere from 1/8th second after the shutter button is pressed to two full seconds later. This allows time for any vibrations to settle down before an image is actually captured. These are the first EOS 5D series models to have built-in timers for long-exposures in Bulb mode and interval timer capability. Pre-set long exposures, anywhere from one second thru 99 hours, 59 minutes, 59 seconds long when in Bulb mode… with an optional remote switch, just lock the shutter open, and walk away. Interval timer lets you shoot from 1 to 99 shots, or an unlimited number at the “00” setting, at timed intervals from 1 second to 99:59:59 between each image. While Canon’s long-established Timer Remote Control accessory can be used with the EOS 5DS these built-in timers minimize the need for that device. EOS 5D Mark III owners may have seen the benefit of the Quick Control Menu (press the “Q” button to access it) — it allows multiple setting changes from one location. With the new EOS 5DS, users can thoroughly customize what appears on that menu, speeding up the series of setting changes even more. Big files need fast transfer to get from point A to point B. EOS 5D Mark III owners who move up to the EOS 5DS will see that their old USB cables won’t work for computer connections with the new camera. EOS 5DS uses a significantly faster USB 3.0 system, with a new connector at the camera, and an included cable protector to ensure the USB and mini-HDMI cables stay positioned securely and correctly. This is another way to streamline changes to different settings, all in one place. EOS 5D Mark III has this handy menu option, allowing users to store up to six commonly used menu commands on one menu screen. With the new EOS 5DS, up to five separate My Menu screens can be created. That means up to 30 different menu items can be set here for faster access or different menu commands for specific situations can be collected and stored here. For instance, users could have a My Menu screen for still images and another for HD video shooting. Some cool new capabilities have found their way into the EOS 5DS. Some make setting up the camera faster and more transparent (such as the Custom Quick Control Menu and new My Menu system). The new mirror system, combined with new mirror lock options, allow for smooth operation in normal hand-held shooting and especially when things slow down during tripod-mounted shooting. While much has stayed the same from EOS 5D Mark III to the EOS 5DS, these and other operation features make the camera even more flexible and streamline its operation in some circumstances. Active by default, Movie Servo AF means AF is continuous during the EOS 5DS’s “awake” state before and during video recording — without pressing a button to activate AF. If the shutter button or rear AF-On button is pressed, AF will lock at its current position. It’s important to understand that the EOS 5DS’s Movie Servo AF is intended more for continuous AF as the camera is moved through a scene and not so much as a tool to track and follow-focus moving subjects. When movie servo AF is disabled, any AF is activated only when the shutter (or rear AF-On) button is pressed… there’s no risk of focus drifting during recording if the camera or subject moves. This is a frequently requested feature, which makes its EOS debut in the EOS 5DS camera. First and foremost: this is entirely separate and in addition to the Interval Timer feature mentioned above (which is selectable when the camera is set for still image shooting only). For Time-lapse Movie to be selectable, the EOS 5DS must be set to its video shooting mode. This new feature enables users to determine an interval between shots. Once a total number of frames is set, the camera calculates how long it will take to record these and how long a resulting movie file will be when played back at 30 fps. Time-lapse Movie shoots the still images and then processes them in-camera into a finished video file, which can be up to two minutes in total playing length (again, at 30 fps playback speed). Shutter Button Function is in the EOS 5DS’s 5th shooting menu, when the Live View/Video switch is set to the video setting. While it’s true that the lion’s share of innovation in the EOS 5DS and 5DS R are aimed at the critical still-image shooter, these new video features will be of interest to some users. In particular, the Time-lapse Movie function greatly simplifies a task that may be of occasional interest even to professionals who shoot still images, making it easy to document a shooting situation or set-up in a way that’s easy to produce (entirely in-camera) and ready to upload to web sites or social media. This report can’t fully document every change that the EOS 5D Mark III user may uncover when using the 50.6 million pixel EOS 5DS, but we’ve touched on different ones that may be of interest once this new camera is put into a shooter’s hands. As with any listing of new features, some will be of more interest to a given photographer than others based on their shooting style, subject matter, and the conditions they shoot in. But what we want to emphasize, again, is that even though the EOS 5DS may look almost identical on the outside to the 22 million pixel EOS 5D Mark III, a lot more has changed than just the CMOS imaging sensor. Finally, everything we mention here applies to both the EOS 5DS and the companion EOS 5DS R cameras. The only difference between those models is the removal of the effect of low-pass filter on the “R” version. Files from the EOS 5DS R will often have a bit more sharpness, but with an added risk of moire patterns with some subjects. The EOS 5DS, therefore, provides that 50.6 million effective pixel resolution in a slightly more user-friendly image.